But despite all the craziness that has consumed the past week, I’ve still had time to enjoy some of the greater things offered in this generation. Hope you enjoy them too! 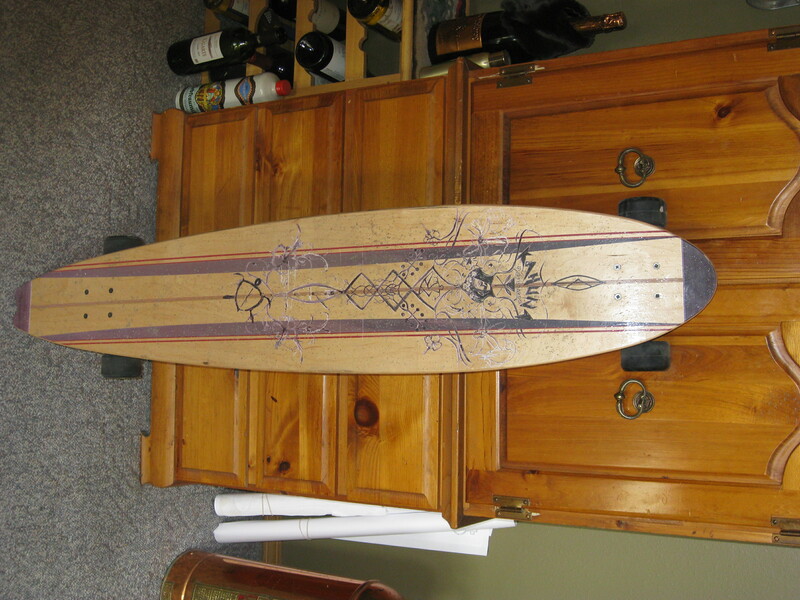 Last July I got myself a birthday present (like you do), splurged and bought an awesome longboard. I was never very good at the whole -board concept. Yeah I snowboard, but skateboarding and longboarding were never my thing. But, I knew that I wanted to get better at it and be able to cruise through town without getting the crap kicked out of me by sidewalk curbs and miniature boulders in the street. The store I went to didn’t have many options, but I ended up falling in love with a certain board that I’ve come to call “Gia” (pronounced Gee-uh). There is a certain surfing movie character that I named this board after, and if you figure it out I will give you a quarter. Anyway, since the snow is pretty much completely gone, I’ve been taking Gia out more often on these warm sunny days. My friend Josh G. has given me a few tips on the technical stuff, but overall I think I’m getting the hang of it! Something tells me I won’t be confident enough to bring Gia to the streets of Chicago, but I’m enjoying her nevertheless. I’m sure our long-distance relationship will last. When was the last time a band took you completely by surprise after listening to them for the first time? For me it was four days ago when I sampled Fun for the first time. Ever since then I’ve had their album “Aim and Ignite” on repeat, learning the lyrics, blasting the volume and doing exactly what the band intends: have fun. Each song on the album is amazing in its own right, but I really do love “Benson Hedges”, “At Least I’m Not As Sad (As I Used To Be)”, and “Be Calm”. I can’t get enough of the catchy melodies and the very, very good lyrics. There’s not much more I can tell you without just having you listen to them and make up your mind. If you’re looking for a fun summer album, then you need not look further than Fun. Listen to the full album here. DO IT! I didn’t cave!!! I didn’t buy it!!! Aren’t you proud? (I did preorder the 2nd season of “True Blood”…but whatever) I’ve been watching Daria on Netflix DVDs and I forgot how amazing the show is. I’ve always enjoyed the strange attitudes of Daria and her artsy friend Jane as they observe and report on the lives of the high school idiots that surround them. Yes, yes, it’s a cartoon and I should probably be catching up on some more “It’s Always Sunny in Philadelphia”, which I also love, but sometimes nothing is better than having a little down time with my favorite pessimist. Although it’s full of the typical high-school stereotypes I think it’s a pretty good depiction of what it’s like to be a blasé outsider in a self-obsessed popular world. Obviously I can’t relate to much of Daria’s female troubles…actually I don’t think I can relate to a single person in that show, but it’s fun anyway. And seeing how “fun” is like my theme this round, I suggest you follow suit and watch the show as well. For the Fun. album I must say I really enjoy the french horn part on “I Wanna Be the One”. I remember when I came across that one when I first got into Miniature Tigers and it was recommended to me by iTunes. MMM, Daria. Love that show. I am going to have to cave and buy it. Aaron had most of the series on his tv/computer thingy but he’s in Laramie and I’m in Missouri needing my Daria fix. I’d already have it but money is tight. I’m listening to Fun right now…I like it, it’s strange…very wonderful suggestion. 😉 Good luck with your novel.